If I cannot be better than them, I will become so much worse. Jude (and her twin, Taryn) are human but their older sister (Vivi)belonged to another world. Their mother fled fairlyland when she was pregnant with Vivi and escaped to the human world. Their mother gave birth to the half-fairy Vivi, married and soon had Jude & Taryn. But their little family could not stay hidden. Madoc (her mother’s ex husband) belongs to the fae and according totheir wild ways, he was honor-bound to murder their mother for abandoning his family and stealing away Vivi. Operating by that same sense of honor, he took in the now-orphaned children to be raised as his own. Father, I am what you made me. I’ve become your daughter after all. Jude and Taryn embrace this wondrous and fearsome world – finding their place among the crazed and the creative, the beasts and the beauties, the tragedies and terrors. However, as much as they try, fairyland is no place for humans. If you hurt me, I wouldn’t cry. I would hurt you back. As Taryn cringes in fear, Jude stiffens her spine. If they get tormented,Jude taunts back. And when Jude is pushed, she attacks. Cardan looks at me as though he’s never seen me before. He looks at me as though no one has ever spoken to him like this. Maybe no one has. 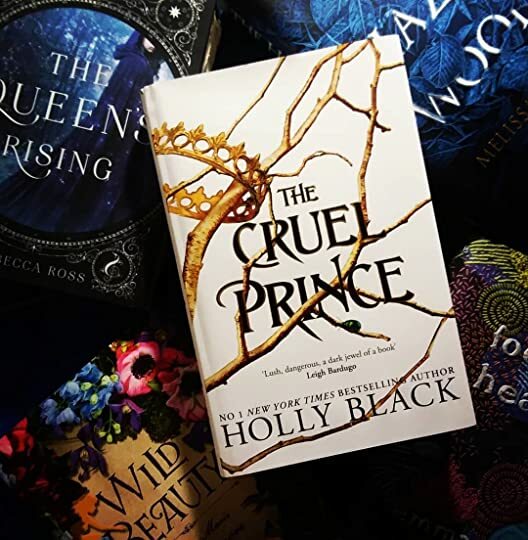 Another stunning book by Holly Black. The beginning was a bit slow, so if you aren’t feeling it at the beginning – keep going! Once the setting and characters are established – wow. Seriously wow. And that ending – I literally cannot wait for book 2. Because you’re like a story that hasn’t happened yet. Because I want to see what you will do. I want to be part of the unfolding of the tale. Read by Caitlin Kelly and she absolutely rocked it. An absolute pleasure to listen to! !